Many Eastern European immigrants came to the United States toward the end of the 19th century and the beginning of the 20th century. They sought religious freedom, better economic conditions, and a better way of life. Many of them settled in Bridgeport, Connecticut, then an industrial town that attracted Eastern Europeans: Slavs, Poles, Rus’, Estonians, Macedonians, and so forth. Having no church of their own and not willing to remain part of the Eastern Catholic Church under the jurisdiction of Rome (the Uniate parishes), a group of these immigrants met with The Reverend Alexis Toth, a Russian Orthodox Christian church leader in the American Midwest who, having resigned his position as a Greek Catholic priest in the Ruthenian Catholic Church, became responsible for the conversions of approximately 20,000 Eastern Rite Catholics to the Russian Orthodox Church, which contributed to the growth of Eastern Orthodoxy in the United States and the eventual establishment of the Orthodox Church in America. He was canonized by the Orthodox Church in 1994. Upon meeting the charismatic Father Alexis, the group passed a resolution to leave the Unia and to return to the Orthodox faith. During 1894, Bishop Nicholas (Ziorov) of San Francisco, bishop of the North American Archdiocese of the Russian Orthodox Church (the “Metropolia”), along with Father Alexis, twice met with this group of future parishioners to get acquainted. On September 25, 1894, Bishop Nicholas, in his archpastoral letter, accepted the group into the Orthodox Church. The parish was organized October 30, 1894, and the building of Holy Ghost Church was completed and dedicated on Palm Sunday, April 26, 1895. Father Alexis dedicated the Church and celebrated the first Divine Liturgy. In 1896, upon the advice of Bishop Nicholas, a member of the new parish, Mr. Makara, went to Russia to solicit funds for the new parish. He received an audience with Tsar Nicholas II, the last emperor of Russia, and received from him a donation of six beautiful, enormous and sonorous bells which has been cast in honor of the Tsar’s coronation in 1896. Upon their arrival in New York, the bells were held up by customs, while American officials awaited payment of the import duty. 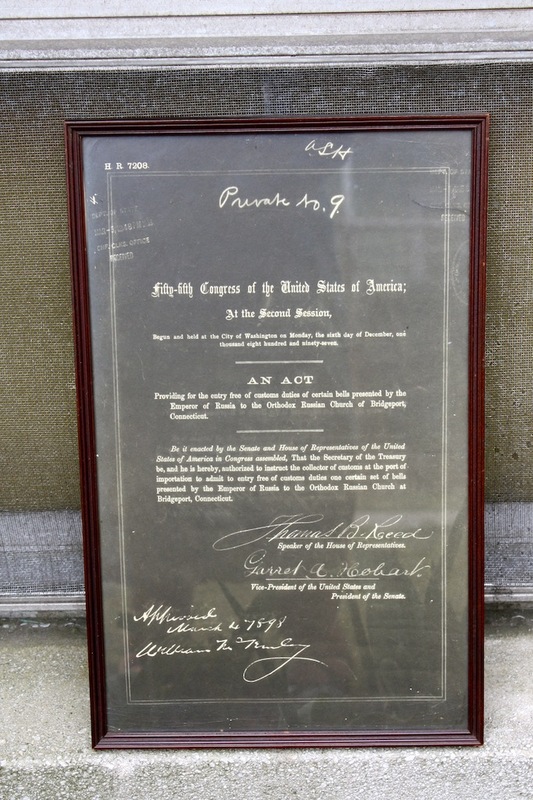 A special bill introduced in the 55th session of the United States Congress, which was adopted and signed by President William McKinley, allowed the bells to enter the United States duty free! Thus, Holy Ghost parish became the Mother Church of Orthodox Christianity in Bridgeport and New England. Even early Orthodox Christian immigrants from Greece, Serbia, Romania, and Albania attended services here until they were able to organize parishes for their own ethnic groups. Early church service records kept by Father Nicholas Vasilieff indicate that he traveled extensively throughout Connecticut to perform the Sacraments of Marriage and Baptism for Orthodox Christians who had no nearby Orthodox Church. His records also indicate that he traveled as far as Springfield and Chicopee, Massachusetts, and Providence, Rhode Island. The parish grew and grew, and eventually a new church building was constructed at the parish’s present site at 1510 East Main St. in Bridgeport. Our present large brick edifice was dedicated on Palm Sunday, April 26, 1937. Rededication of Holy Ghost parish occurred on June 13, 1981, and included a special honor: His Grace Gregory, bishop of Alaska, brought with him relics of St. Herman of Alaska and sealed them in wax within the new altar. In October 1994 we celebrated the 100th Anniversary of Holy Ghost Church and the 200th Anniversary of Orthodox Christianity in America. That same year, we especially remembered “St. Alexis of Wilkes-Barre,” who as Father Alexis Toth in 1894 assisted our immigrants to return to the faith of the apostles, the faith of the early church fathers, and saints—the Orthodox Christian faith. The largest weighs 4,000 pounds and contains in raised relief the images of the Russian rulers Tsar Nicholas II and Tsarina Alexandra, with icons of our Savior Jesus Christ on the opposite side. 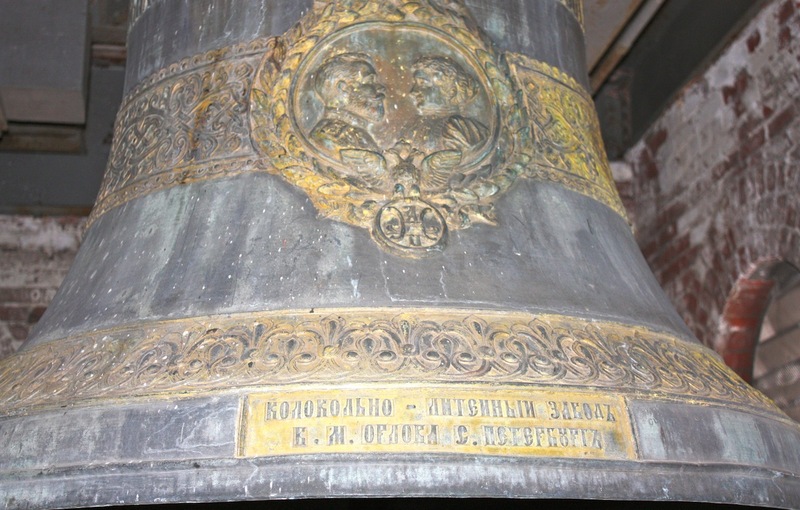 Two smaller bells contain the icons of St. Nicholas and St. Alexandra (the patron saints of Tsar Nicholas II and Tsarina Alexandra). All were cast by the master metallurgist, B. M. Orlov, in St. Petersburg, Russia. Their sonorous tones are produced by an alloy of bronze, copper, brass, silver, and other minerals, the formula for which was a closely guarded secret of Imperial Russia and which was lost when the Russian Empire experienced its demise in 1917 with the Bolshevik Revolution. 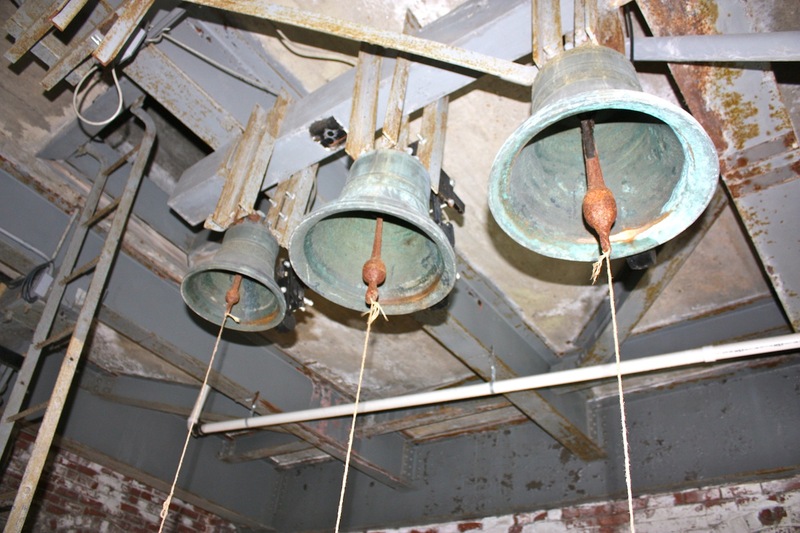 The bells were at first rung by hand but now are connected to an electronic system. The magnificent stained glass windows in our church building mainly depict the major feast days celebrated in the Orthodox Church. In 1983 the Stained Glass Association of America conducted a survey of stained glass windows in America. Lydia and Alexander Garasimowicz, parishioners, assisted the association with the survey. As a result, information of the windows was entered in a computer base at the University of Massachusetts, in Amherst, which is available to art historians. A large icon of St Seraphim of Sarov (in a kiot, i.e., wooden frame) was painted by the monks on Mount Athos, Greece. Also, the parish received a gift of four Icons from the Imperial House of Russian 1896, which include Ss. Nicholas of Myra and Alexandra, the Mother of God (Greek = Theotokos) holding the infant Jesus, Christ the Savior, and Ss. Cyril and Methodius, who brought the Christian faith to the Slavic peoples. These Icons are painted in the Italian style (popular during the 19th and early 20th century) and are located on the iconostasis,or icon screen. Some Icons were written (painted) by two of our parishioners. John Padick (Piatak) wrote icons of Ss. Martha and Mary and Jesus preaching in the Temple. Richard Jankura wrote four icons: The New Martyr Grand Dutchess Elizabeth, St. Seraphim of Sarov, St. Tikhon the Confessor, Patriarch of Moscow, and Blessed Xenia of St. Petersburg. In addition, we have another special icon: St. Panteleimon (in a kiot), which was given by workers from Russia who worked in the munition factory during WWI and who worshipped at Holy Ghost Church. You may learn more about Orthodox Christian icons and their importance in the Orthodox Christian tradition here.